The "fool at heart" is the passion of fire, the emptiness of ego, and the character of selflessness, while "a water droplet" is the value of life, the direction of planning and the hope for the future. 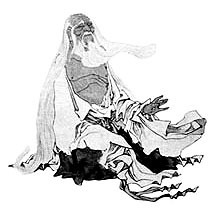 Lao Zi also uses water to represent the goodness, the kindness, and virtue of the Tao. He says that "Eminent goodness is like water. Water is good at benefitting all things, yet it actively completes. It retires to undersirable places. Thus it is near to Tao." (8:1, 2) Mistakenly, however, the standard text of Tao Te Ching defines the water as "uncompetitive", rather than "actively completing". The sentence "it is uncompetitive" has many scholars interpreting Laoism and Taoism as being passive and quiet. This is a misleading conception. There are passions in Laoism and there is madness in Taoism. We do not understand the nature of water thoroughly if we say that its character is inactive, and that its motion is passive. Water is the most active element on earth and in the sky. It is everywhere on earth and circulates constantly in our organism. It is active in its performance and competitive in occupying it own position. Water never ceases to battle with fire and light over the space it occupies. It peacefully competes against the chaos caused by fire, and actively transforms the resulting murkiness, poison, and contamination. This final truth awakens us to the heart of spiritual practice as well as the richness of life. Normally, everyone expects the outcome of situations to be good, yet few people realize the value of working theough the bad things that happen. Everyone hopes to reap the benefits of teaching without learning the power of mastering the bad. Everyone knows the difference between good and bad, yet no one embraces the deeds occurring between them. Whoever understands the paradox knows the game of life. Those who remain in the paradox have yet to awaken to the mystery of life.